Additional features like Electricity, IMPS and Android etc. could also be provided on demand of our clients with additional charges as applicable. We have 2 different software versions for B2B recharge. It Contains 4 channels as below. Admin can only add Master Distributor, like wise Master Distributor can only add Distributor and distributor can only add retailer. There is no skip level admin cannot add distributor or retailer. The channel flows from “top to bottom”. This is to make sure that the client gets the accurate profit and loss statement. This is a main control panel for this application. Admin have full authority to create/change its channel members. 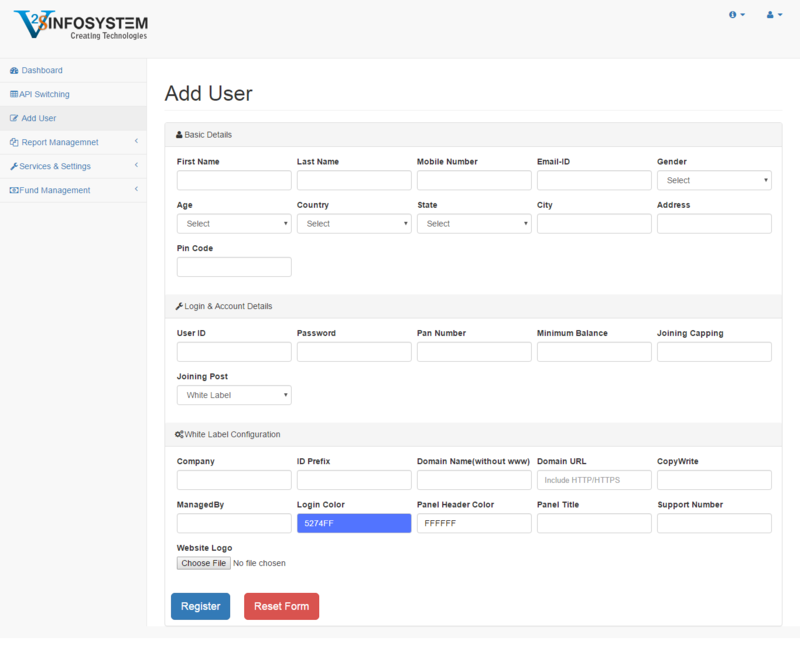 (Master Distributor, Distributor and Retailer) Admin can empanel unlimited members in its channel. Admin can transfer unlimited funds to its members and can able to control full funding action for its members. Admin can check all transaction report with full description. Admin can switch recharge API operator wise according to their choice. Admin can block particular operator overall or retailer wise. Admin can check its gross business volume, profit and loss day wise and month wise. Admin can alert their notification to its channel members. Admin can send bulk mail or SMS to its member. Admin have full authority to change its all member’s commission. NOTE: Recharge could be managed/ manipulated from single page by admin panel. Reliability & Performance Our Recharge product is very user friendly, flexible, accurate, attractive. Technology used We are using .NET technology with C#, AJAX, JQuery, XML, HTML, CSS, SQL, LINQ & Entity Framework to develop this Web application. Database aspects We design strong database tables, procedures and triggers for fast searching, handling large number of concurrent HTTP requests and for more accurate data. Website Front Page Design We provide attractive and different home page for every client as per their requirements (In this package we will provide 5 pages website with contact us form and design would be done as per client suggestion) . Extra services We can also add all utility services like ( Electricity, Insurance, Railway enquiry form, Money Transfer - IMPS/NEFT etc) All Utility API will be provided by client (Extra charges would be applicable) . Security aspects We uses appropriate security module for countering hacking. Monthly maintenance (If needed) After the development of your Mobile Recharge Software, we also offer 100% maintenance services at affordable cost, so that you don’t have to suffer with any kind of software related problem and issues. We will provide prepaid, postpaid, DTH, data card operators in this package. Major services like registration, fund transfer/reverse, balance enquiry, complaint placing can be done using SMS service in our application. Business calculator for getting accurate profit and loss day wise / API wise. Strong database design for accurate results. Eye catching design in web templates as per client's suggestion.We will provide 5 pages eye catching HTML design in this package. We will provide 1 year free technical assistance in this package. During this period you can call us any time if you are facing any type of software related issue & we will provide you instant solution for that and after that a monthly maintenance charge would be applicable for our instant support service. It Contains 5 channels as below. Admin can only add Master Distributor, like wise Master Distributor can only add Super Distributor and Super Distributor can only add Distributor and Distributor can only add retailer. There is no skip level admin cannot add distributor or retailer. The channel flows from “top to bottom”. This is to make sure that the client gets the accurate profit and loss statement. This is a main control panel for this application. Admin have full authority to create/change its channel members. 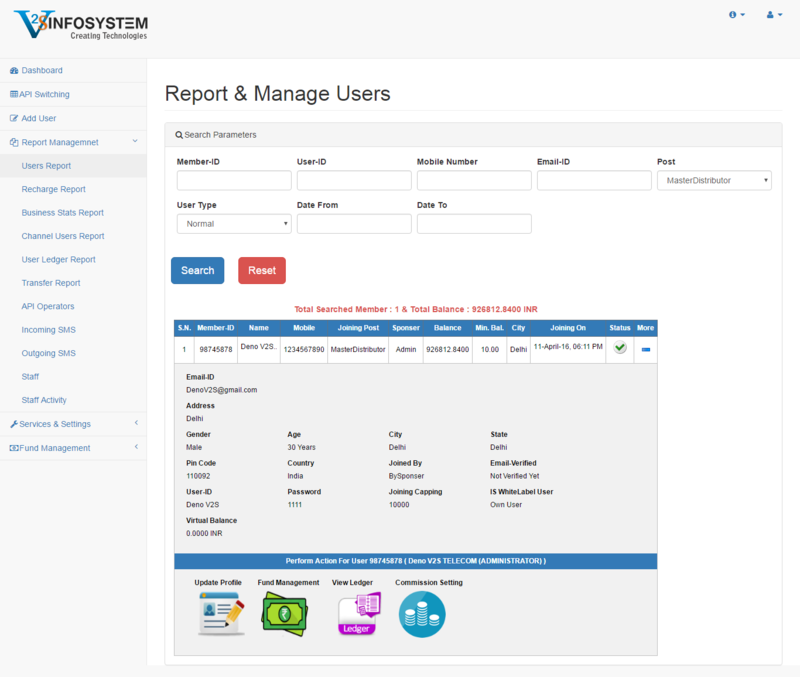 (Master Distributor, Super Distributor, Distributor and Retailer) Admin can empanel unlimited members in its channel. Admin can transfer unlimited funds to its members and can able to control full funding action for its members. Admin can check all transaction report with full description. 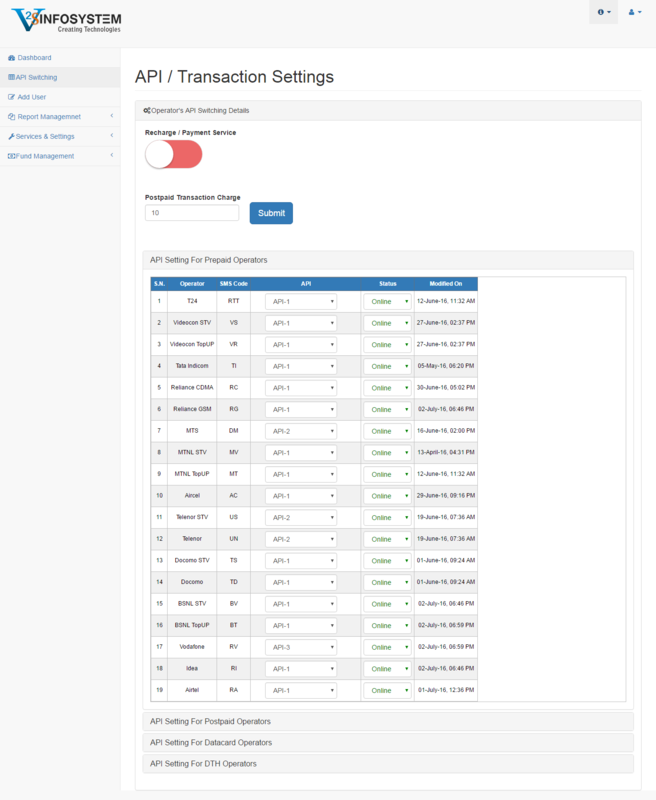 Admin can switch recharge API operator wise according to their choice. Admin can block particular operator overall or retailer wise. Admin can check its gross business volume, profit and loss day wise and month wise. Admin can alert their notification to its channel members. Admin can send bulk mail or SMS to its member. Admin have full authority to change its all member’s commission. We will provide 3 months free hosting service and after that client have to pay 600-1000 INR per month for hosting service. Graphical and detailed representation of business is also there for version 2. (No need of preparing graph separately for presentation/growth chart comes in handy. Our version 2 offers relative, Specific and multiple recharge related search options. Advanced search for transfer In and Transfer Out for accurate reports. Version 2 Module can handle large number of HTTP request. 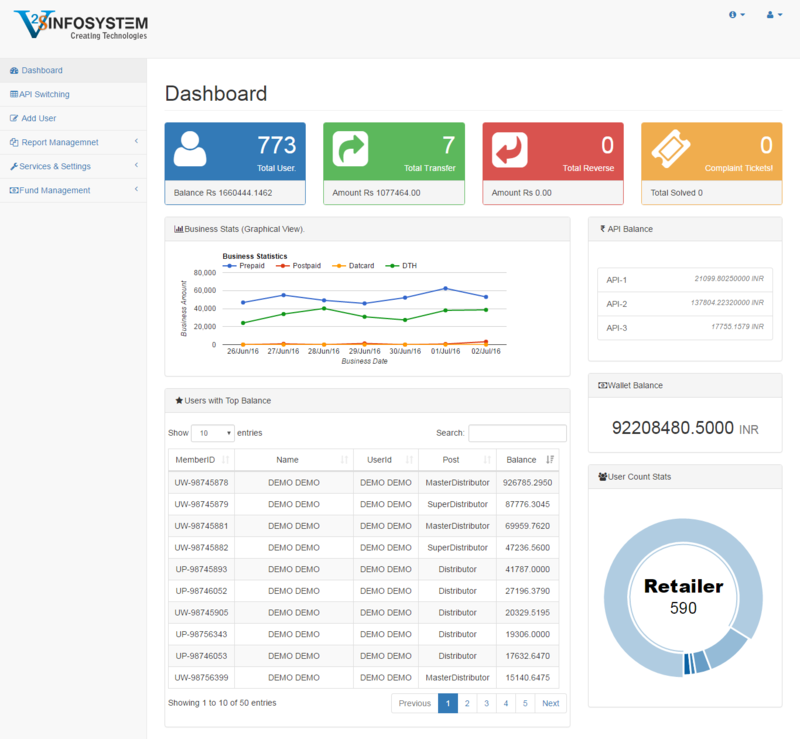 Admin will have full control for incoming and outgoing the inventory for hustle free business. We will provide 1.5 year free technical assistance in this package. 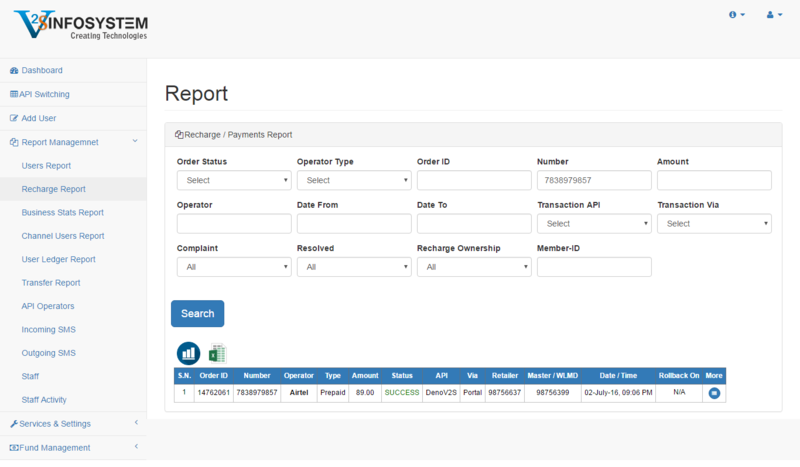 We Provide Complete Mobile Recharge System ( LIKE : B2B / B2C / WhiteLabel Solution / API Reseller Software / Inventory and Account Management ). We do not deal in APIs. We only deal in softwares. Here We are recommending genuine API suppliers to you. Actually we only recomend which suppliers who are actually our clients so there are noting to worry about it. We will disclose the supplier name after completion of sign up process with us. API one time setup charges would be given by supplier side. Please submit your mobile no. You will get login credential on you mobile through sms soon.